Nothing says comfort like a big bowl of spaghetti and meatballs. And, nothing says Italian food like a big bowl of spaghetti and meatballs—unless you are Italian. If you go to Italy, you will not find a dish called spaghetti and meatballs. In the bowl of a stand mixer, combine the bread and milk mixture, ground chuck, pork, egg yolks, 1 teaspoon of kosher salt, black pepper, allspice,nutmeg, and onions. Beat on medium speed for 1 to 2 minutes. Once all of the meatballs are cooked, decrease the heat to low and add the flour to the pan or skillet.Whisk until lightly browned, approximately 1 to 2 minutes. Gradually add the beef stock and whisk until sauce begins to thicken. Add the cream and continue to cook until the gravy reaches the desired consistency. 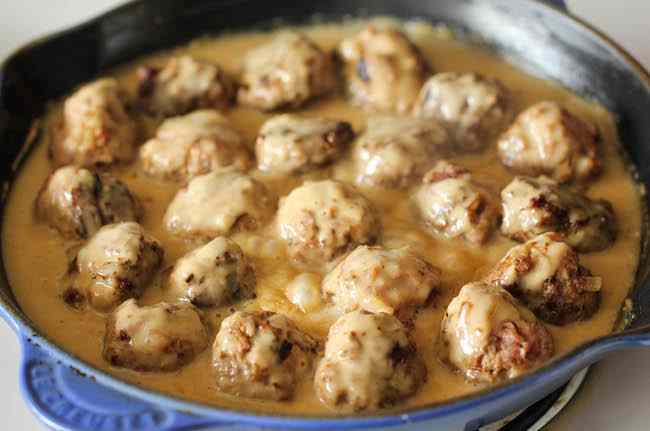 Remove the meatballs from the oven, cover with the gravy and serve.